Her literary debut, the novel Slepá mapa / Blind Map, was published when she was fifty, soon to be followed by the novel Hotýlek / The Little Hotel. Her most successful book to date is her latest novel Hana / Hana, which has become a huge hit especially on social media. Alena Mornštajnová’s position on the Czech market is getting stronger by the day. In the influential Databáze knih (the Czech equivalent of Goodreads), Hana is currently listed as the best book by reader evaluation; the novel also scored highly in the prestigious Lidové noviny Book of the Year 2017 poll, achieving 7th-9th place. In recent months, Hana has become a regular among Host Publishers’ (www.hostbrno.cz, see left-hand sidebar) top-selling titles, and it has been doing extremely well on the bestseller lists nationwide too. 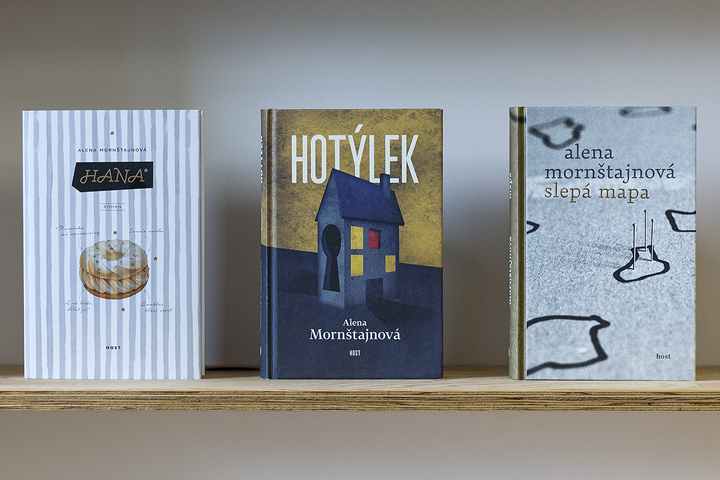 Owing to great reader interest, Host Publishers is reprinting all three of Alena Mornštajnová’s novels, which to date have sold over 90,000 copies in total. Paperback editions of Hana and Slepá mapa / Blind Map have been published too, Hotýlek /The Little Hotel is being prepared. Hana won two categories (Book of the Year 2017 and New Book of 2017) within the above mentioned Databáze knih (more here). The same title won also both the categories of Czech Book Award (the main prize and the students’prize too – this happened for the first time in the history of this award), more here. Host Publishers is pleased to announce the emergence of another Czech bestselling woman author, who takes her place alongside Kateřina Tučková and Petra Soukupová.